Pete Rose has been convicted of nothing in his recent blowup in the press surrounding allegations that he did inappropriate things with a underage woman in Ohio back in the 1970's, but you wouldn't know that unless you were asking to buy his signed cards and memorabilia at the stadium at Citizens Bank Park. Rose, who guided the Phillies to their first World Championship in 1980, apparently has earned a scarlet letter, as his items that have been signed have been cleaned out of sight and it seems like he a man who didn't exist for eager Phillies fans looking to purchase some piece of memories that connect Rose with the Phillies first ever World Series win. Just a few months ago, I purchased an awesome signed card with Rose's autograph at the Hunt Auctions booth at CBP, to me seemed like a great deal. It was a few months prior to Pete's date with the Phillies to be put on the Phils 'Wall of Fame' - the induction for Rose onto the Phillies 'Wall' never happened of course. It was cancelled upon a firestorm of allegations and insinuations that was a result of Rose's lawsuit against long time detractor, John Dowd. The whole sordid affair seemed to unfold like a soap opera in the Philadelphia press, and the news pressured the Phillies to cancel the whole event based on the court of popular opinion. News stories surfaced on the TV and radio concerning Rose just a week or so before Rose was supposed to be honored on-field by the Phils. The facts remain though, that Rose has never has been charged with a crime in relationship to this, and will never be. The statue of limitations in Ohio for any such allegations or charges is 20 years, going back to the 1970's would 40 years or double the time that anyone could be held accountable for a crime like this, if committed, could face any punishment for. 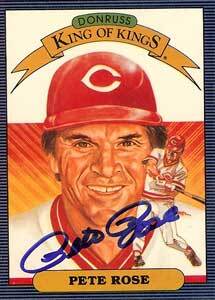 Getting back to the Pete Rose memorabilia ban, I spoke with an unnamed employee recently at the Hunt Auctions company, who has a sales booth at Citizens Bank Park, and they told me that there was a memo circulated that there would be no placing of Pete Rose items for sale at the booth, unless he was 'part of a group' of players. Meaning that you can't buy a single signed item that featured Rose, but you could probably buy an item that he signed if there were more than one player on a card or photo item. That doesn't make a whole lot of sense to me, but apparently Hunt Auctions thinks that it does. History speaks for itself in regards to Pete Rose's contributions to the first ever winning of the crown of baseball that took this team until 1980 to do. If you do the math, that's almost a 100 years since the Philllies came into existence in 1883 to the time that the franchise won the first ever coveted World Series win. Peter Edward Rose was signed to the Phillies back in the early 1980's to do just that, bring a World Championship to the city of Philadelphia, his brash, swaggering style swept into the city of Philadelphia with Rose's big fur coats and driving the best Cadillac available at the time, and he delivered along with his teammates, a memory that will never be erased no matter what happens from now till the end of time.